I had an issue with my AC late in the evening. Joe called me and after speaking with him for 10 minutes he was able to tell me what he believed it was and how he was going to help me. Joe showed up to my house on Saturday, a holiday weekend, and explained to me everything he determined to be wrong with my system. Joe was straightforward with the problems and gave a straightforward solution with a very reasonable price. Joe came out first thing this morning and got our unit running that 2 other air conditioning companies condemned in the last 3 days! Joe could not have been any nicer and he took the time to listen to me ramble about our AC unit’s history. He truly listened and found a problem that may have been there since it was installed. I’ve had so many companies look at my AC over the years, hoping someone would solve my issues (it’s never been very cold). Then along came Joe from Trident today and figured out things that no one else found… my heat was coming on at the same time as my air conditioning! I do not normally participate in reviewing companies, but I wanted to share my great find in case it helps anyone else looking for a wonderful, reliable AC company. Thank you Joe! My husband and I are so thankful for the new heat pump and a/c unit. 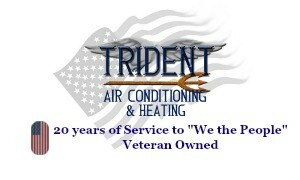 Most important, however, is the professionalism, concern for our needs, and willingness of the owner and workers of Trident A/C on completion of our installation. Our hats off to you Joey and your team!! Thank you, thank you! May you be blessed! !